If you’re going to have an executive desk, you absolutely need a reclining office chair. They go hand in hand! Some of the chairs on this list are just for this purpose, while others are gaming chairs! The great part about these is that they can recline almost entirely, giving you a comfy place to take a quick nap between work! You absolutely need this office furniture in your workspace! But first, let’s look at some things you should know. Material: For the most part, the chairs in this list are going to be made from either leather or faux leather. The leather is the most common material, so the chair is nice and soft while remaining comfortable and functional. Size: The dimensions of the chair will tell you how big the chair will be so that you can plan out if it will fit behind your desk or if you need something of a different size entirely. Color: The color of the chair determines whether it’s going to match the other décor in your office. The most common colors on this list are black and brown though sometimes they also come in white and other colors! Foot Rest: Most of these chairs will have a footrest tucked away under the chair that can be released when you put it into a reclining position. This makes it more comfortable for napping and reduces pressure on your legs. Swivel: Chairs that swivel will usually have a range of 360 degrees to turn so that you can get all of your work done on every one of your desk surfaces. The swivel feature is really useful. Warranty: The warranty is the amount of time you have to report any defects or manufacturing errors in the product, in order to get it refunded or replaced. Warranties protect both you and your purchase from problems! Now that you know all there is to know about these office chairs, let’s take a look at some reclining chair reviews! We’ve picked through a selection of chairs to bring you only the best. We’ve conducted research so you can make an informed decision about the best chair for you! Check out our top pick and budget pick first, as they’re the ones we liked best. The rest of our list is full of amazing chairs as well, though! Our choice for one of the best reclining office chairs is this one by VIVA OFFICE. 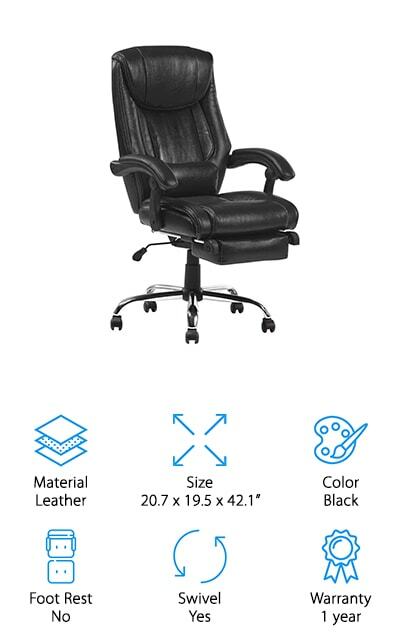 It’s a high back chair made of bonded leather, and it swivels a full 360 degrees, which is amazing if you’ve got an L-shaped or U-shaped desk. The headrest and armrests are padded and comfortable and provide additional support to help you feel more comfortable while you work. This chair can hold a total of 250 pounds, while still being comfy to sit in. We love the napping feature of this office chair and the footrest that helps you reach the maximum comfort level needed to achieve the perfect power nap between working periods. It also has built-in lumbar support so the times that you are working are more comfortable. The base is a beautiful chrome and the padded upholstery helps to keep your legs from going numb. 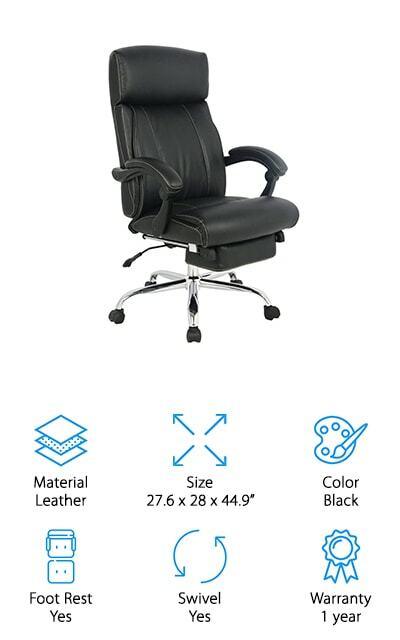 It really is the perfect all-around office chair, and we know you’ll love it! 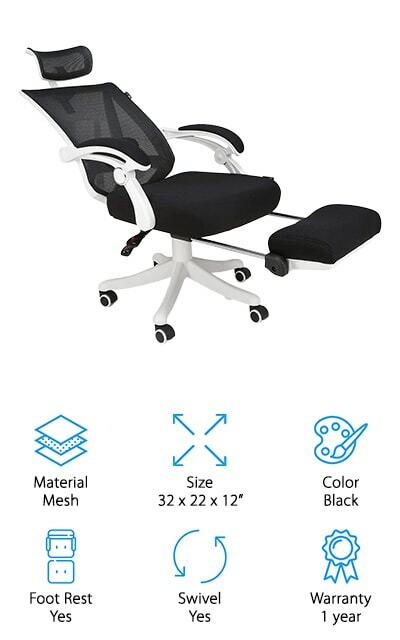 BestOffice makes this high-quality office chair that’s perfect for gaming and working. It’s got a built-in lumbar cushion that you can also remove if you’re fine without it, as well as a removable headrest that’s perfect for a quick nap. Also perfect for this is the footrest that comes with it and can be put up when you’re ready to lay back and take a load off for a few moments. It’s great for power napping. It has a 360-degree swivel as well as the ability to lay flat so you can get comfortable and stay that way. We love the design of this chair and the armrests as well - and we know that you will too if you give it a try! You can also adjust it to just about any height and angle, perfect for adjusting to desks and tables, and also for taking a quick nap between sessions. It’s pretty amazing! This racing-style ergonomic office chair is comfortable and stylish. It comes covered in soft leather upholstery and a ton of padding that will keep you comfortable even on your most intense work days. The soft armrests will perfectly support your arms while you game or attend to your business. The frame is made of heavy tubular steel, and it’s extremely durable so you’ll have this chair for a while! It has a 360-degree swiveling mechanism that allows you to get just about anywhere. It has a great tilting feature that allows you to take different positions when you’re trying to relax or take a nap. 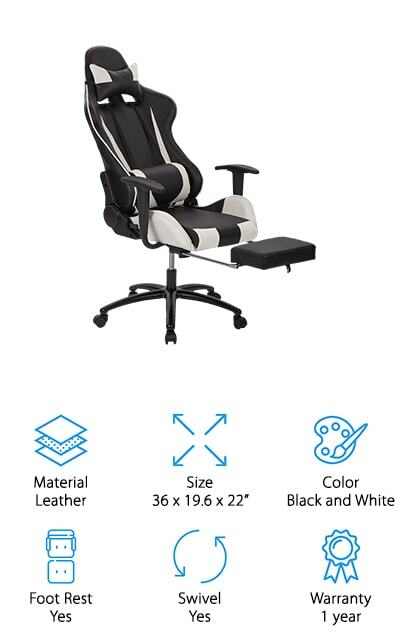 It’s the perfect chair for gaming because it’s comfortable for the long hours of gaming or working. It’s especially good for professional gamers! 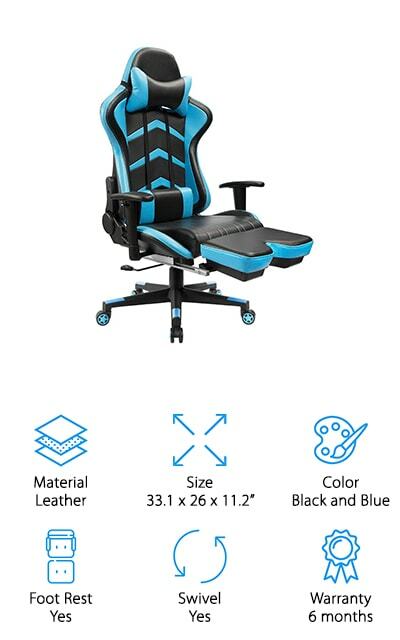 This entry into their gaming chair series is the perfect gift for the gamer in your life or someone who works at their desk most of the day! This reclining executive chair looks perfect for an office and would look stunning behind a big executive desk. And you’ll be able to use every aspect of that desk with the swiveling feature of this chair. It has a nylon base and casters so that it’s stable and moves well. What we love most about this chair are the flip-up armrests, so you can put them down when you don’t want to deal with them and then move them up when you need the extra support. It’s a solid construction that holds up to 250 pounds, and the waterfall edge of the seat reduces the pressure on the back of your legs, and it’s soft and comfortable. It’s upholstered with bonded leather, and working for long periods won’t be a problem anymore, because you won’t want to get out of it! This reliable, sturdy chair will be your constant companion in your office, even though long work days! Merax’s Inno executive office chair is an amazing napping chair. One of the best features is the pivoting lumbar support, which allows three different positions for the lumbar cushion. This is amazing for a variety of conditions and problems, and it helps support you in the way that you best need. It has a reclining angle of 180 degrees, which means that it can tilt back to nearly flat to allow you to relax and take a nap between work sessions. It also comes in black and white so it will fit perfectly in with whatever décor you have going on. It has dual stitching on the edges, which is amazing and durable and adds another level of elegance to the design. This chair will absolutely not look out of place in your office setting. The leather is so soft and comfortable, and there’s a footrest hidden under the edge of the chair, which we love! Yamasoro makes this reclining office chair that’s made of great quality leather and fully padded to give you the most comfortable office experience that you can imagine. The folding armrests can either be engaged or disengaged, so you can have the support that you need for your arms when you need it and no extra awkwardness when you don’t want it. The casters and base are made of high-quality casters that roll perfectly and smoothly and without ripping or ruining your surfaces. You can adjust it to several angles and lock them in place, creating the perfect relaxation center. It’s a chair made for taller people, and it can hold up to 350 pounds. This super comfortable chair is durable and ready for anything, and it comes in black and grey, red, and white as well. The padding is completely foam, so it’s nice and comfortable, and the back is even contoured for back support! 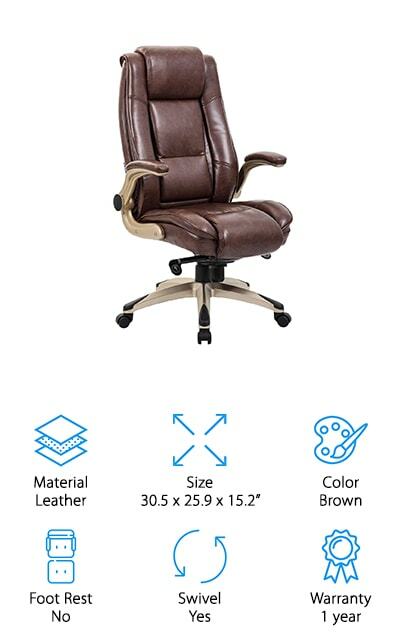 This Mophorn leather office chair is the perfect reclining seat for use in your office. We love the cushioned armrests that give you optimal support and performance during either long gaming sessions or long work days. It swivels a full 360 degrees, so you can get to all parts of your desk with a full range of motion. 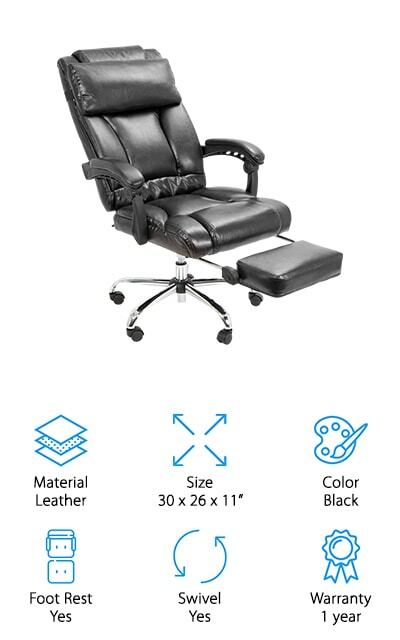 The best part is that it adjusts and reclines so that you can take a quick nap between phone calls or while you’re waiting for a game to start. 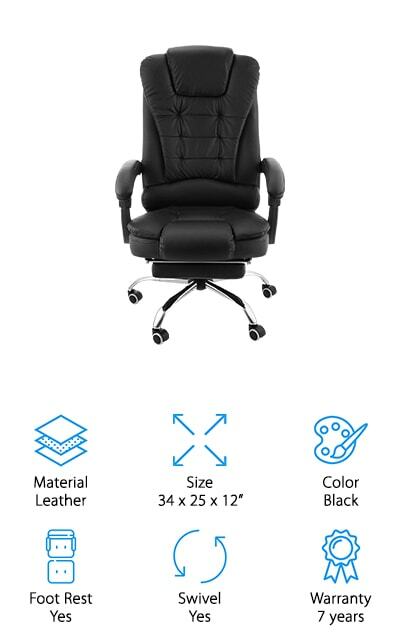 The footrest is just as comfortable and cushioned as the rest of the chair, so you can get unique all-over comfort including a lumbar support section which will ease the pain of being at your desk all day. It’s got a heavy-duty base that will keep it from tipping over no matter what position you have it in, which is super useful as well for people who move around a lot. This comfortable office chair from Respawn is a perfect seat for any of the activities that require you to be sitting at your desk for long periods – from work to intense gaming sessions. 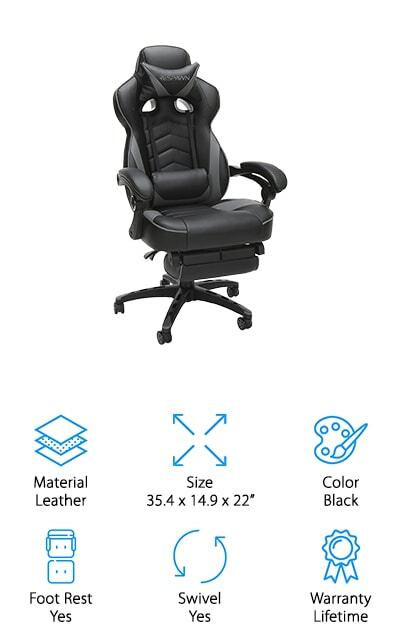 Get all of your work done and then move on to top the leaderboards with this beautiful and ergonomic chair. It comes with a black base color and accents in green, blue, red, white, and gray, so you’ll have all of your bases covered for the office. You can raise and lower the chair as well as reclining it, and the 360-degree swivel makes it an amazing chair for use with larger desks and setups. The padded armrests are perfect for relaxing when you need a break from the keyboard for a moment. We love that the padding on the back and seat of the chair is segmented to provide the maximum level of comfort. The limited lifetime warranty is another perk! This Barton chair is the perfect office chair, both simple and functional. In fact, if you got a full set of them they would make the perfect conference room chairs for your workplace! We love the swivel feature, with the high-quality casters that will give you a smooth glide. The leather-covered cushions are comfortable and supportive, as well as the cushioned armrests and high back. The seat is completely adjustable, and the back reclines to almost 170 degrees, allowing you an almost-flat sleeping surface for a quick nap in the office when you need a break. The footrest is nice and cushioned as well! There’s an adjustable headrest that is comfortable and almost overstuffed in order to provide the most comfort for your dozing between work sessions. The chair base is heavy enough that you won’t feel like it’s going to tip over when you recline it. We love how cushioned and comfortable this chair is! Hbada makes this reclining office chair that’s tall and comfortable and works perfectly for both taller people and shorter ones both. Instead of being made of leather, this chair is made of cloth and mesh so it’s the perfect alternative to people who aren’t fond of leather. We love the tilting feature and the adjustable headrest as well as the lumbar support that you can adjust to both your height and any problems that you may have. The headrest even has seven different height adjustment options and a 30-degree rotation, so it’s more comfortable for people of different heights. The high back is really nice and it’s entirely made of mesh so it’s breathable and comfortable. The nylon base and heavy casters will help to keep the chair grounded and sturdy, as well as moving smoothly over your floor, so you won’t rip your flooring or scratch up the hardwood. We love the simple design of this chair!